An image from the NASA/ESA Hubble Space Telescope reveals clusters of infant stars that formed in a ring around the core of the barred-spiral galaxy NGC 4314. This stellar nursery, whose inhabitants were created within the past 5 million years, is the only place in the entire galaxy where new stars are being born. The Hubble image is being presented today (June 11) at the American Astronomical Society meeting in San Diego, Calif.
Notes: Hubble observation data related to the right image. 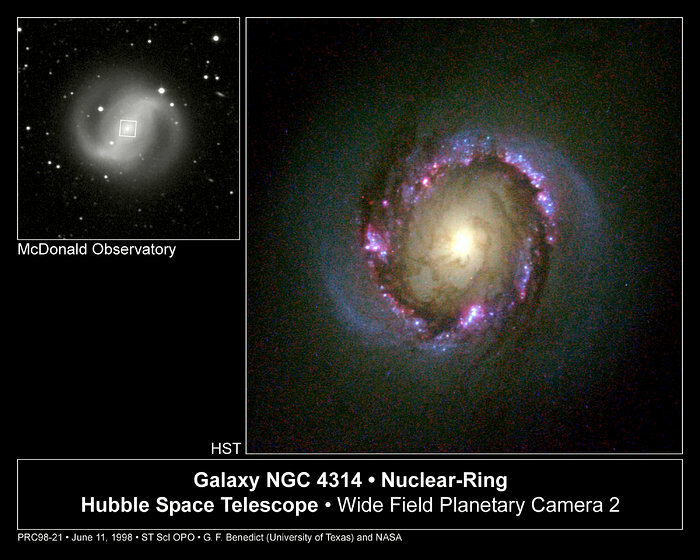 The left image was captured by the 30-inch telescope Prime Focus Camera at the McDonald Observatory.